Some Toyota hybrid sedans have fuel filler pipes that were never reconnected to the gas tank during assembly. Does that make them fuel spiller pipes? (Hold for applause). 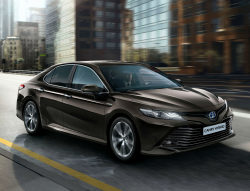 A small number of 2019 Avalon Hybrid and Camry Hybrid sedans will be recalled to have those pipes inspected and possibly replaced.